The City of London Club in Old Broad Street is usually a sedate meeting place for financial folk. But on Friday, a maverick Irish businessman, sitting next to a bowler-hatted Winston Churchill lookalike, gave the British government a seven-day ultimatum to revise its airport security rules. "These measures are giving the terrorists and extremists an unbelievable public relations success," regaled Michael O'Leary, chief executive of Irish airline Ryanair. "They must be rolling around the caves of Pakistan laughing at the British government and the British people at the moment. Look at what we can do with just a couple of mobile phonecalls". Strong words from a man who began his professional life as a tax accountant but typical of the vitriol that Michael O'Leary heaps on governments, airport authorities, other airlines and even his own passengers - a management style that has not won him universal admiration. "He certainly loves to fight and he's picked many fights over the years," says Irish journalist Siobhan Creaton, the author of a book on Ryanair. "He's managed to upset the Catholic church through advertising, he's managed to upset his crew often, passengers as well in many instances." The 44-year-old man who controls Europe's most profitable airline was born into a wealthy family and enjoyed a first-class education. According to Ms Creaton, it was at Clongowes Wood school that he came in contact with the Ryan family, an event which would shape his career. Tony Ryan - whose sons were educated at Clongowes - made a large fortune in the aircraft leasing business in the 1970s and 1980s. Like so many other millionaires before him, he chose to invest a small fortune in starting an airline. "He'd set up Ryanair as a small little airline that could ferry people between Waterford and Gatwick airport, like a taxi service really for his three sons," says Siobhan Creaton. "It was a loss-making, pipsqueak airline really, going nowhere." Ryanair's problem was the one that has done for a string of start-up airlines: high costs and low passenger numbers. By this stage, Michael O'Leary had attended Trinity College in Dublin, worked as an accountant and been recruited as Mr Ryan's right hand man. His boss sent him in to sort out Ryanair's problems and Michael O'Leary initially told him he should shut the airline down. As a last throw of the dice, Michael O'Leary ditched business class in favour of a one-size-fits-all approach. He worked the airline's people and planes much harder and halved fares. The pile-it-high approach succeeded spectacularly. Ryanair grew so fast that BA soon abandoned the Heathrow-Dublin route. He then took advantage of Europe-wide liberalisation to start a base at Stansted airport in Essex, with flights to Glasgow Prestwick. He soon found himself in competition with another high profile 'no frills' airline easyJet, the start of an uneasy relationship with the latter's founder Stelios Haji-Ioannou. 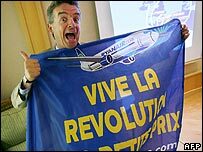 Critics accuse Michael O'Leary of running Ryanair like a bus service but he is unrepentant, castigating other airlines for being inefficient and offering "ridiculously high" costs. Every day 100,000 passengers step aboard one of Ryanair's Boeing 737s - the only type that the airline flies. They pay an average fare of under £30, which Michael O'Leary says is possible only because of a corporate obsession with costs. This extends to potential staff being charged for the privilege of being interviewed. A first officer must pay £50 for an interview and if he or she passes the first hurdle, a further £200 for a simulator check. Some disgruntled former staff have accused the airline of mistreating its employees but Ryanair says it staff enjoy better pay than any of the major European airlines. Whatever their views on Michael O'Leary, people acknowledge that he is one of the most charismatic figures in an industry which has always attracted strong and ebullient personalities. His frequent news conferences are often theatrical, including one occasion when he dressed as the Pope to preach the low-fares sermon. His unorthodox approach to business includes inverting the usual airline-airport arrangement by persuading some airports to pay him for the privilege of handling Ryanair passengers. He incurred the wrath of the European Commission over subsidies paid by Charleroi airport in Belgium - known to Ryanair as "Brussels South". 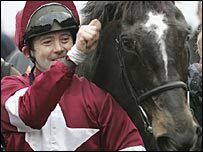 On a personal level, Michael O'Leary married Anita Farrell, a Dublin banker, in 2003. Their son Matt was born last year - to a fortune estimated at close to £300m. Some of this nest egg has been spent on building up a growing string of racehorses. Michael O'Leary has already tasted success on the turf, his horse War of Attrition winning this year's Cheltenham Gold Cup. Siobhan Creaton says the Ryanair boss has earned so much that he does not need to work another day but that he likes to keep busy. "He's somebody that will always be busy. People don't tend to know him that well - he tends to stay within his own family and his own circle, and I don't think there's many people that can figure out what he will do next." Experts believe it is unlikely that O'Leary will walk away from Ryanair any time soon. 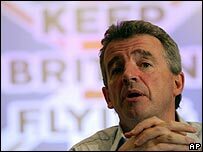 "He's made a lot of money and he must have met his ambitions," says Malcolm Ginsberg, an aviation journalist who has been following Michael O'Leary's career for nearly 20 years. "I believe like a lot of men of his type it's a drug. That he just has to keep going."